Par boil the potatoes in a saucepan with double cream and milk in a pot. Add the garlic and nutmeg and season well. Arrange the potatoes neatly in an ovenproof dish, making sure the top layer and pour the sauce over them. Cover the dish with greaseproof paper and tinfoil and place in the oven for 1 hour. 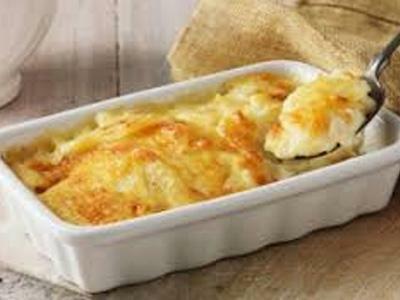 Remove from the oven and sprinkle with cheese and return to the oven for another 10 minutes or until the cheeses is brown and bubbling on top.